Hello! I’m Rebekah. 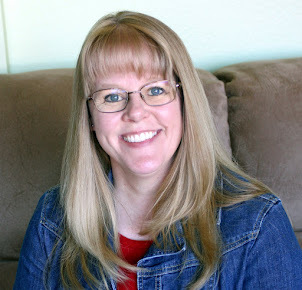 I recently have become blogging friends with Melissa through three online scrapbooking related classes that we have taken together. The togetherness wasn’t planned, but we have similar addictions, so we’re drawn to these types of classes! In one of these classes, Beyond Blogging for Scrapbookers, we were asked in one of our class prompts to think about guest blogging. 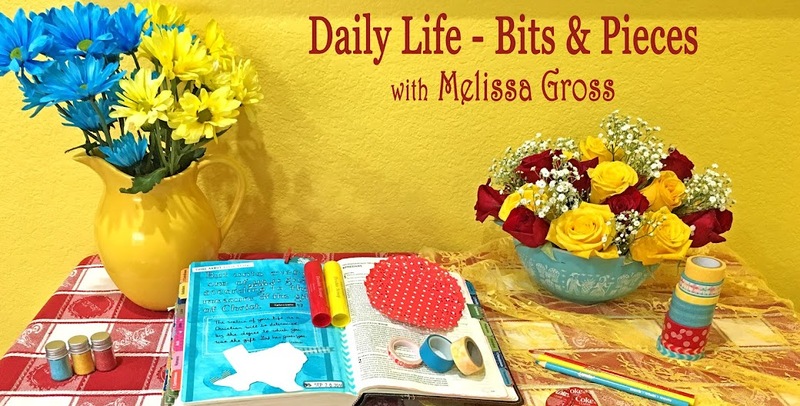 As Melissa’s guest blogger today, I thought I’d share my insights on Becky Higgin’s Project Life kit. I have last year’s edition which is completely sold out. You can view her current edition on Amazon.com . I am thoroughly enjoying my Project Life journey this year. I started on January 1st. To help me with the daily process of photo taking and journaling, I started a private blog where I daily upload my picture and journaling. Then, at the end of the week I sit down with my developed pictures and journal based on what I’ve blogged about. I love that my blog helps me to remember all the little details that I might otherwise forget by the end of the week. For each photo, I use Ali Edward’s Days and Months hand-drawn brushes. I use Photoshop Elements for this step. I also use my corner rounder punch and round the edges of each photo to match all the cards that come with the kit. Some weeks I include some extra pages. 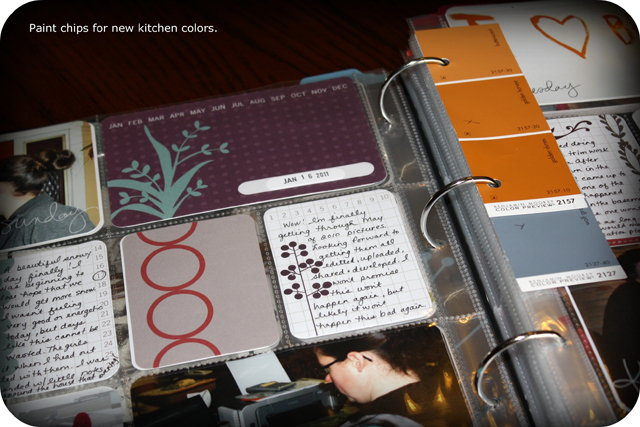 When we re-painted our kitchen, of course, that was the photo of the day, and I included the paint chips in my album. Sometimes it’s a recipe that goes along with one of my photos. I think it will be wonderful someday when we look back on these photos and see the recipe right there. I can just picture my kids saying “Oh, I remember Mom (or Dad) making this, I wonder where the recipe is?” It will be right there! If there are note-worthy headlines in the news, I’ll print off the article. 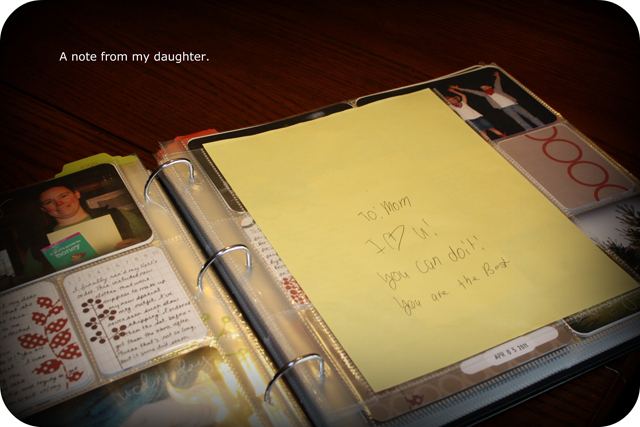 I’ve also included notes from my kids. Sheet music from one of my daughter’s solo ensemble events (you know that will get forgotten years from now!). Hymns we sang, a memorial card, and recipes for the food we took over when a dear elderly friend of ours died recently. The memorial card was tucked inside a sheet protector. I cut it down to size and sewed up the cut edge. Ali Edwards gives a great tutorial on this. For all of these extra pages, I use a variety of 12x12 page protectors. Some have 9 4x4 squares, some have room for a 5x7. 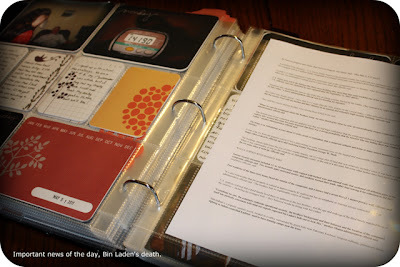 This is how you make your Project Life album your own. I love how Becky stresses that so much in her posts about her product. I’m a perfectionist and like to do things just the way they are suppose to be done, but this has been a wonderful journey outside my comfort zone! There are many ways that you can use Project Life! 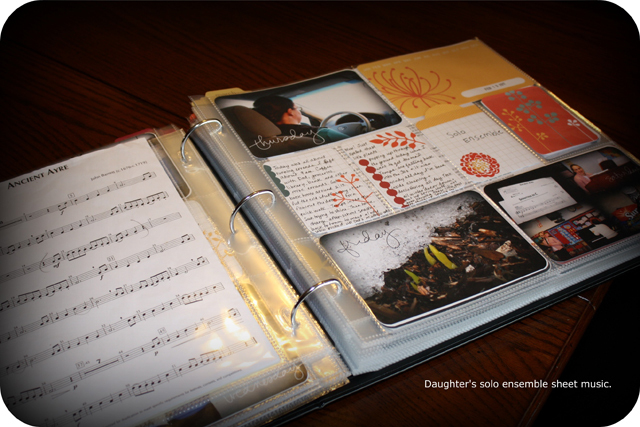 You could document your child’s first year of life, your first year of wedded bliss. It could be a year of photography challenges. Or you could document your own childhood pictures! You could document a month or a week at a time instead of the daily. The possibilities are endless, and I love that about her kit. It’s so easy to personalize it to your own needs. And it’s so simple! 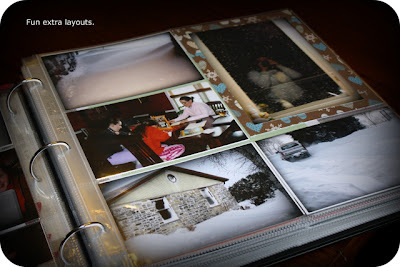 We’re 19 weeks into 2011, and I feel more caught up on scrapbooking than I’ve ever felt. It feels so good to have such an easy system in place for documenting our daily lives. Thank you Rebekah for sharing about how you are using Project Life to document and preserve your memories! I really love the idea of using a private blog to pull everything together. Clever! It's always great to see a guest post from a blogger I haven't had a chance to get to know yet. Thanks for a shot at guest posting Melissa! It's always fun to write about something you love and something that has worked for you. Hi Sian! I've seen you a bit over at the BBFS class. Lovely to meet Rebekah, and see how the Project Life is being interpreted - I really like how everyday things are being included: a proper scrapbook! Yes, glad blogger is working again! I also do Project Life. I love how you are adding so much extras to yours. I started doing that early in the year last year and lost steam, but still kept taking photos. I'm playing catch up on it this year while still taking photos and blogging about my photos this year which has meant I'm not doing as good of a job as collecting ephemera. Thanks for the inspiration as I will start doing that again. 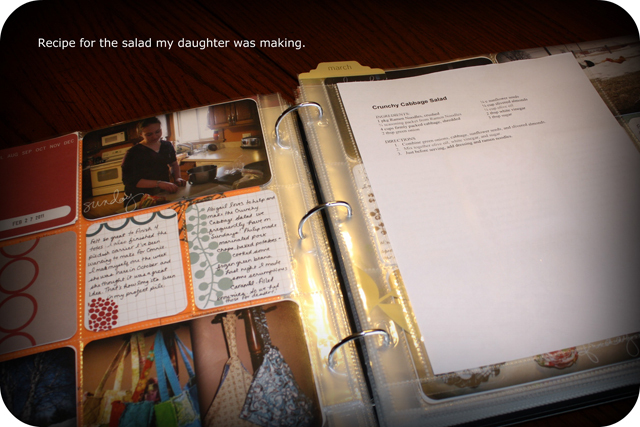 And I love the idea of printing out recipes and daily headlines. Do you get the headlines from the internet? If so, where? I loved hearing about your process. Thanks - now off ot your blog to read what Melissa has to say. @Margie, yes, I just copy/paste the article into Word and print it off. Or sometimes I do a screen capture. Thank you Melissa for having me over to your blog. It was fun to write about something I love so much and has made such a huge difference in how I feel about my scrapping success!